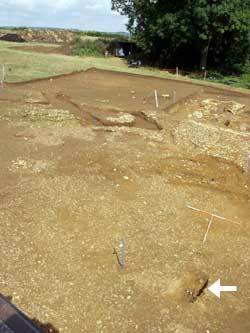 On the last day of digging in 2003, three human bones were uncovered in a small exploratory pit dug in the area to the East of the main villa range, underneath the paved surfaced. The small pit was covered up and the find was not made public at the time in order to protect the remains and ensure that they were treated in full acordance with the law on exhumations. Nevertheless, one leg bone was removed illicitly at some time before the skeleton was fully exhumed ten days after its discovery. The archaeology indicates that the body had been interred before the Roman paved area was laid down - whoever paved the area didn't know about the grave just underneath. 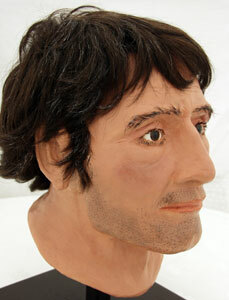 So it is an early-Roman burial, associated with the 2nd century enclosure and round house. 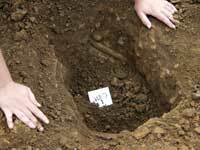 The body had been buried without obvious ceremony, placed face-down in a small pit rather than a shaped grave. There were no grave goods of any kind. An initial examination of the skeleton has revealed that it is male and above average height. There is no evidence of trauma (injury), and he seems to have been in generally good health. Wear on his backbone indicates that he was accustomed to shifting heavy loads. His teeth are in good condition, suggesting a balanced diet, but there is evidence of periostitis in his leg bones, indicating blood poisoning at some time. 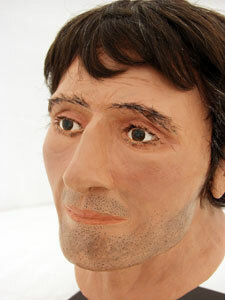 His head shape suggests he was of local ancestry rather than a mediterranean incomer. You can read the formal reconstruction report here. CLICK HERE for a 'virtual reality' turntable animation of the head. 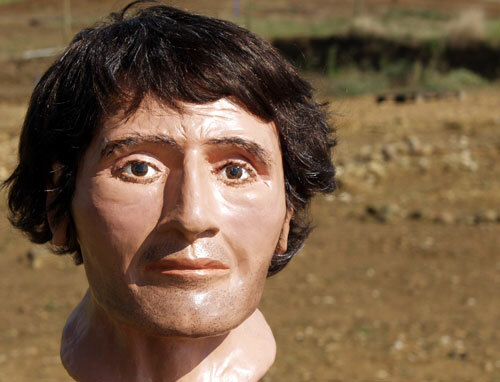 There will be more work done on the skeleton including, we hope, carbon dating, and dental analysis to determine place of birth and residence. 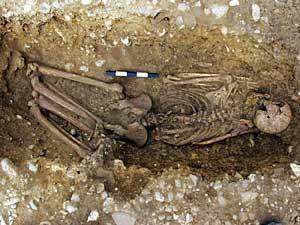 It is hope to compare this skeleton with that of the "Saxon Warrior". Full reports will be published here in due course.